First pallet loading in the HIP van. Linda is ecstatic that we can now accommodate a full pallet of food! Even before HIP was officially an organization, we struggled with transportation. We really needed a cargo van to transport Northwest Harvest, Food Lifeline, and other food donations safely. For some years our personal Subaru Legacy station wagon did the job, which we also used to deliver meals downtown. The difficulty at Northwest Harvest and Food Lifeline was that pallets of food had to be hand loaded into the station wagon by us. No forklift could be used. So Erick Blandin, HIP friend and UW employee, located a much needed, used, 1998 Chevy G2 Cargo Van from the University of Washington Surplus store. 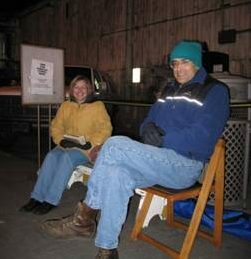 In October of 2006, HIP was able to raise money through a successful “Fund-a-Van” auction. On December 4th, Gordon Morrow (HIP co-founder and former HIP Board member) checked out the van that Erick had located. We couldn’t test drive the van, but we could start the engine and look under the hood. With only 20,410 miles we could get years of service. The best part was that it could hold two pallets and we would be able to use the forklift! Linda waiting in line from 6:00 in the morning for the auction to begin at noon! The day that the van was available for sale we were presented with one hurdle: Whoever was first in line before the noon sale on December 5th would be able to purchase any available surplus vehicle of their choice that day. And, there was only one van. The price was set at $2500, and the warehouse was located right next to the the Montlake Cut. It was open to the outside and there was a bench with a sign stating the “line starts here.” Jerry dropped me off at 6 AM and I was the first one there! I sat on the bench with the check in my pocket and waited until the sale started at noon. It was a long wait and a little cold in the morning, but several HIP board members dropped by throughout the morning with tea and conversation while I waited. The next person interested in the sale came at 7 AM and asked whether I would be buying the van. When I said I was, he left. I felt safe waiting at the warehouse, as UW security housed their vehicles inside. When noon came, the van was purchased, the keys and paperwork were handed over, and off I went. Over the years, the van has carried tons of food and thousands of meals to hungry individuals. It continues to be dependable and fun to drive. Over the last year or two, however, long drives to Tukwila and south Seattle with two pallet loads of shelf stable milk or other heavy products have made for a strained drive back on the freeway. Therefore we purchased a new Transit van (with generous support from the Boeing Employees Community Fund), which is up to the task when it comes to transporting a full, heavy load. But we still use the old van for smaller trips and continue to shower it with gratitude and love. 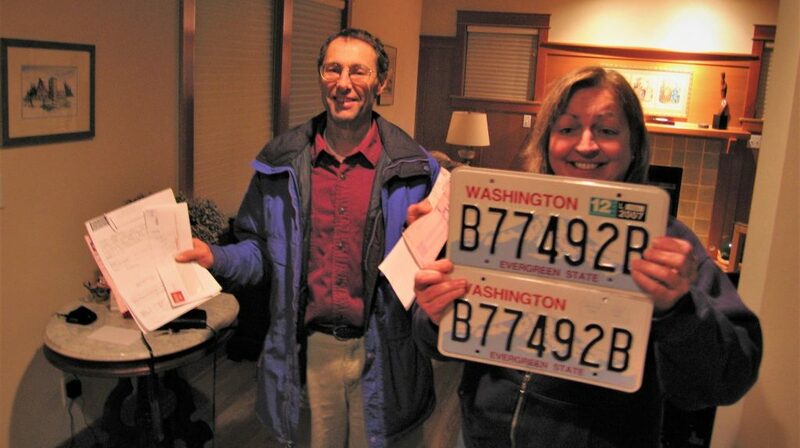 Happy Linda and Jerry with new HIP van papers and license plates! Check out more Ten-Year Anniversary stories here.